nanjIyar highlights that the worshippers (dhEvas) of emperumAn have arrived to worship him and thus AzhwAr requests emperumAn to wake up. Through this pAsuram, it is established that srIman nArAyaNan is the worshippable supreme being and all other dhEvathas are his worshippers. periyavAchchAn piLLai highlights that the sun can dispel the external darkness, but only srIman nArAyaNan can dispel the internal darkness (ignorance). AzhwAr requests that emperumAn wakes up to see that the ignorance is dispelled and also to bless the dhEvas, kings, etc., who have arrived to worship him. arangaththammA – Oh lord/master who is lying down in srIragangam! Oh lord/master who is lying down in srIragangam! The sun has arrived at the peak of the eastern side dispelling the heavy darkness of the night. As the beautiful morning time has arrived, honey is oozing out of the best of the flowers. The dhEvas and kings are arriving quickly in groups pushing each other to the south side of the sannidhi (temple) where your divine vision will reach. They stand there filling the entire place. Along with them, big groups of male and female elephants (which are the vehicles of the dhEvas, kings, etc) and persons playing musical instruments have arrived. Their sounds and noises that reaches all directions in eager anticipation of your waking up resembles the great sound of an ocean with fierce waves. Thus, you kindly wake up now and give your blessings to all who have assembled here. 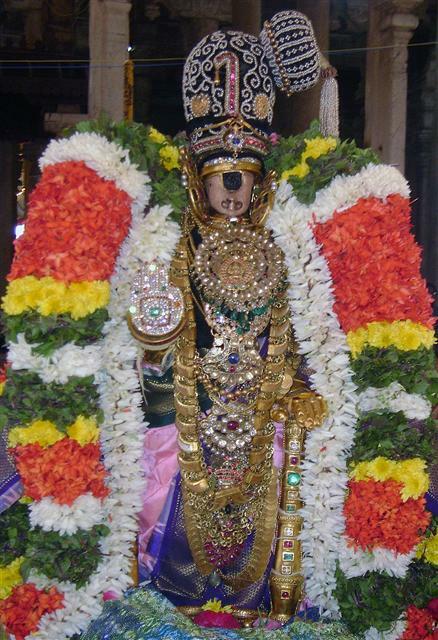 periyAzhwAr thirumozhi 4.1.1 “kathirAyiramiravi kalandheriththAl oththa nIL mudiyan” – bhagavAn‘s divine head itself shines radiantly with the brightness of 1000 suns. The Sun arises from the eastern side where srIranganAthan‘s lotus feet are. So, in both sides, bhagavAn‘s radiance is glowing brilliantly. Early morning time is highlighted as auspicious time to meditate on emperumAn. dhEvas and kings (who are filled with pride) arrive at emperumAn‘s sannidhi hurriedly to have their desires fulfilled. srIranganAthan is glorified as ubhaya vibhUthi nAthan (one who rules both spiritual and material worlds) independently. AzhwAr identifying himself as ananya gathi:, meaning one who does not have any other refuge than bhagavAn himself. Just like when some one wakes up, an assistant/servitor may bring a lamp to light their day, when you wake up, sun himself lights the world with his rays. It is Sun’s small kainkaryam (service) for you. He also arrived in the eastern side to have your divine dharsan and the blessings. As quoted in thaithriya upanishadh “bishOdhEthi sUrya:“, he appears on time and performs his duty as a fearful servant of you. parAsara smruthi “brAhmE muhurththam cha uththAya chinthayEth AthamanO hitham | harir harir haririthi vyAharEdh vaishNava: pumAn ||” – (A vaishNava will wake up early in the morning (around 4am) and will meditate upon the well-being of the AthmA (self). He will recite the name of hari at that time 3 times) and in thiruppAvai 29 “chiRRam chirukAlE vandhunnaich chEviththu” (arriving in the early morning to worship you). Since the dhivya dhEsam is srIrangam which is the dwelling place of srIranganAthan who never gets separated from his divine consort srIranganAyaki thAyAr, the male elephants also arrived with their counterparts (female elephants) to serve the divine couple. This entry was posted in mudhalAyiram, thiruppaLLiyezhuchchi and tagged thiruppalliyezhuchi thondaradippodi alwar on December 28, 2014 by Sarathy Thothathri.